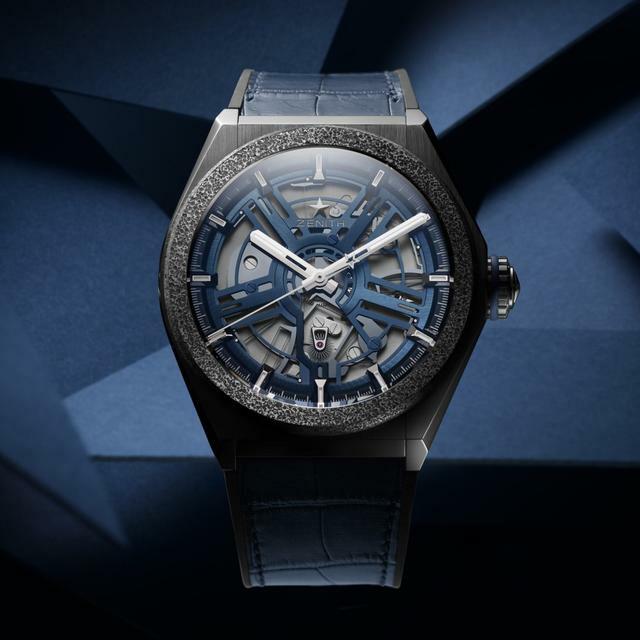 With Baselworld 2019 now history, and with the next edition of the now-smaller event set to begin next year on April 30, let’s take a look at some of this year’s most interesting debuts in this first of two posts. 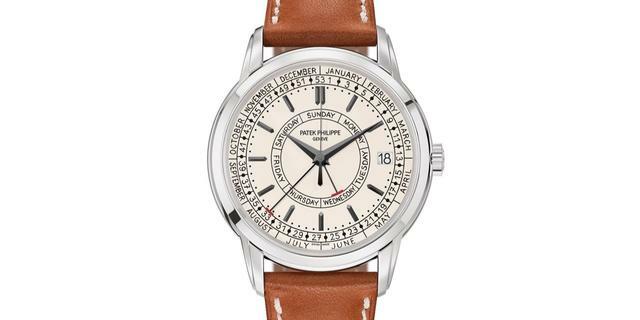 Patek Philippe's Ref. 5212A-001 Calatrava Weekly Calendar in stainless steel features a new self-winding base movement. Though far from the only standout in a very strong set of 2019 Patek Philippe debuts, this watch seemed to arrive from left field. The whimsical Patek Philippe dial is marked from top to bottom with a dial font based on a designer’s handwriting. 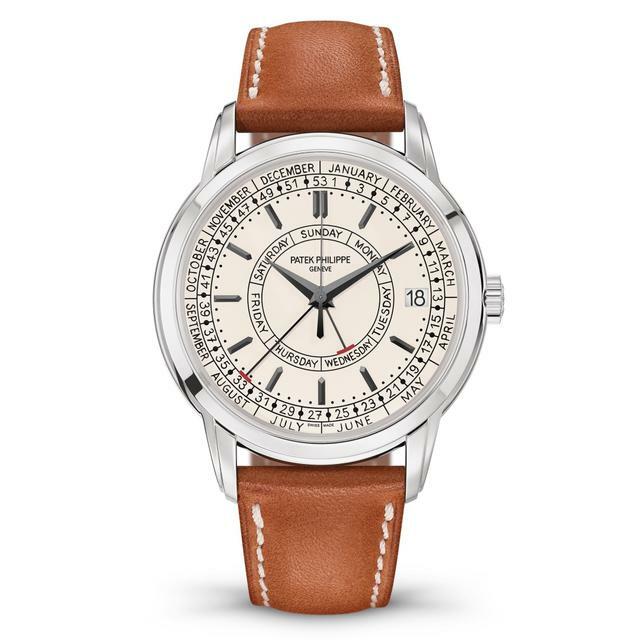 What’s more, underneath the silver opaline dial Patek Philippe unveils an entirely new caliber (26-330 S C J SE), a semi-integrated mechanism displaying the current week number, the day and the date, set when needed using correctors at 8 o’clock and 10 o’clock. Oh, did I mention the 40mm case is steel, not Patek Philippe’s go-to case material. 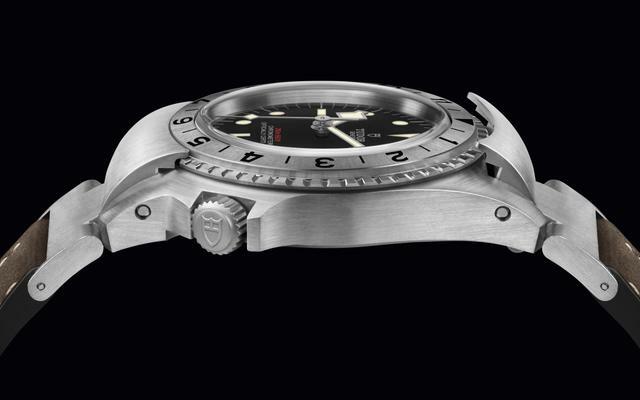 Indeed, with all these unusual attributes, and given that the watch is now the only steel model (though, not a limited edition) within the Calatrava collection, expect a line at the showcase. You’ll be paying $33,450. The impressive Zenith Defy Inventor. Now made in serial production, the Defy’s blue silicon-blade-based replacement for the traditional spring balance buzzes (at 18 Hz) with the sound of the future. Chronometrically precise, reliable and stable, Zenith’s oscillator is the star here. It’s made from a single element (compared with thirty or so components of a standard regulating organ) and eliminates contact, friction, wear and deformation. The oscillator’s vibrations are fascinating to behold inside their equally futuristic and lightweight 44mm case made of titanium and Aeronith (an aluminum-polymer composite). 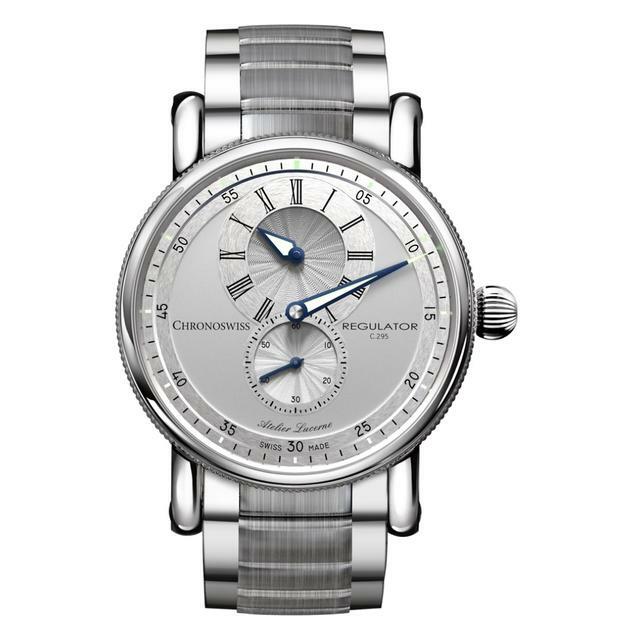 Despite all appearances, however, the three hands tell the current time, not the time in the future, and they do so with chronometer-certified hours, minutes and seconds indications. Price: $17,800. Now the thinnest mechanical chronograph, with its 3.30mm thick mechanical manufacture GMT chronograph movement (Caliber BVL 318), this Baselworld 2019 highlight measures 6.90mm thick, with a 42mm diameter titanium case and sandblasted titanium dial. 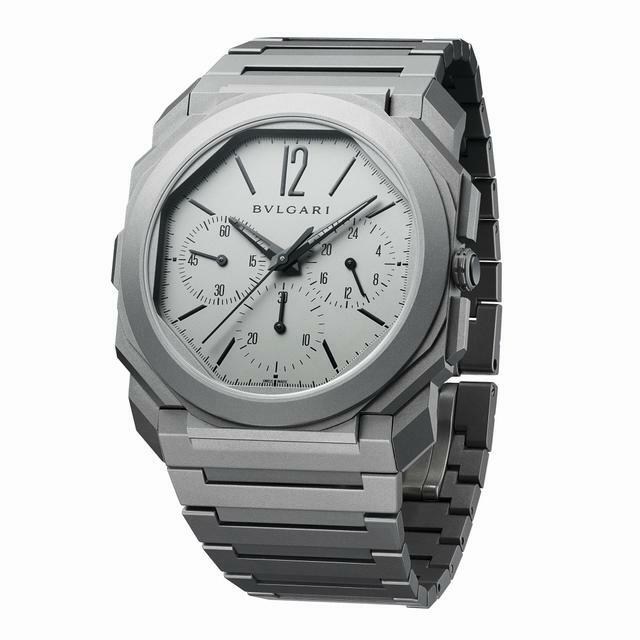 The debut underscores Bulgari’s reign as the top maker of ultra-thin watches, with this latest the fifth ultra-thin model in as many years. The new watch retains the still-unusual peripheral winding rotor seen in last year’s record-breaking Octo Finissimo Tourbillon Automatic and adds a GMT function (local time is set by the pusher at 9 o’clock). Bulgari’s new ultra-thin movement is fully integrated and displays classic chronograph functions. Price: $17,600. 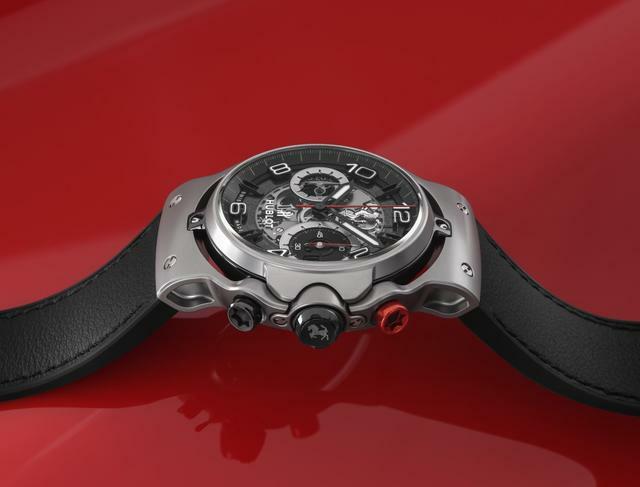 Teaming with Ferrari, Hublot let the famed automaker’s Maranello workshops design the curves on this new 45mm Classic Fusion case. Inside, Hublot has fit its own UNICO manufacture flyback chronograph movement, displaying its column wheel directly from the dial. The entirely new Classic Fusion Ferrari GT is available in three different cases: Titanium (limited edition of 1,000 pieces), King Gold (limited edition of 500 pieces) and 3D Carbon (limited edition of 500 pieces). Prices start at $22,000 (for titanium-cased model, pictured). One of three superb new Promasters made to celebrate the line’s thirtieth anniversary, this Eco-Drive Aqualand 200m Promaster 30th Anniversary Limited Model is a 46.1mm steel-cased diver with extra-luminous dial, an analog depth meter and a host of dive features required in ISO and JIS-compliant dive watches. 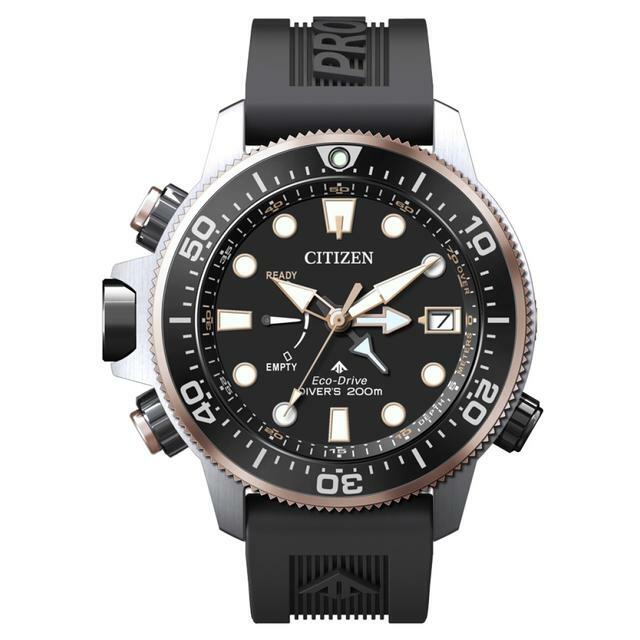 These include a highly visible power reserve indicator, dive alarm for alerts in case of excess speed in ascending, water sensor, screw-locking crown, screw-locking buttons and unidirectional bezel. The watch, a limited edition of 6,000 units, is priced at $775, and will be available this June. One of seven new TAG Heuer Autavia debuts. Two are cased in bronze. 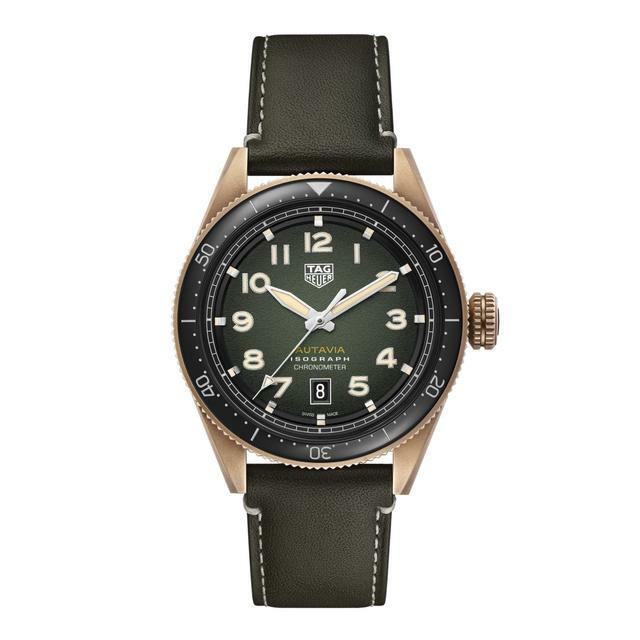 TAG Heuer’s new Autavia collection includes five 42mm steel watches and two 42mm bronze-cased watches that feature the familiar rounded case, large crown and beveled lugs from the first Autavia generation in the 1960s. Each also sports a bidirectional rotating bezel with a 60-minute scale in black ceramic, blue ceramic or stainless steel. As a technical bonus, the newest edition of TAG Heuer’s Caliber 5 chronograph movement features a carbon-composite hairspring, indicated by TAG Heuer with the word ‘Isograph’ on the watch’s dial. Prices start at $3,500. One of three MB&F Legacy Machine Flying T models. Here, the dial plate and case are both fully set with baguette-cut diamonds. 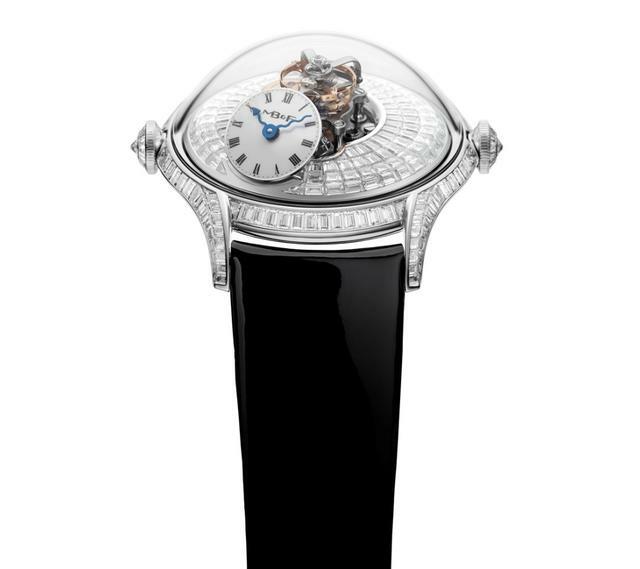 As the first MB&F watch collection made specifically for women, the Legacy Machine Flying T is not only MB&F’s smallest-diameter model, at 38.5mm across, but it’s also the first MB&F horological art piece designed with what historically have been considered feminine touches, including a generous helping of diamonds. This watch, stunning on any wrist, is made with a round white gold case, a cambered bezel and long thin lugs set with diamonds. A high convex sapphire dome protects and focuses the eye on a dramatic, slow beat flying tourbillon – the Flying T in the collection’s name. Prices: $115,000 (black lacquer dial plate with case set with brilliant-cut diamonds; $145,000 (dial plate and case both fully set with brilliant-cut diamonds; $315,000 (dial plate and case both fully set with baguette-cut diamonds). 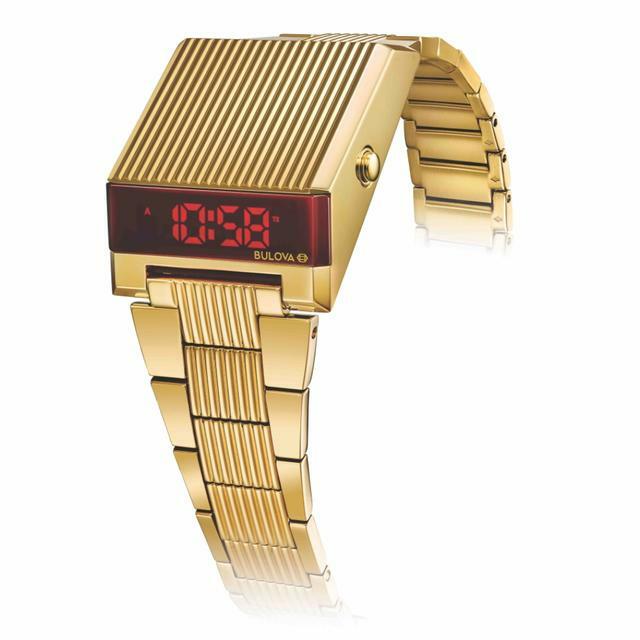 Bulova’s retro-futuristic Computron LED is a fun re-issue of the 1970s version, but now with dual time display. Press the crown to sequentially display the hours, minutes, seconds, month, date, day, and dual time zone. The Bulova Computron LED will be made with an all gold-plated case and bracelet with red LED display ($395) and a black IP with rubber strap ($295) and a steel version with blue LED ($295). With a well-considered update, this bedrock Chronoswiss collection is now a bit sporty with shorter lugs, an attached and wholly new steel bracelet and greater water resistance (to 100 meters). The new dials are also more contemporary, and available in blue, grey/black and silver (pictured). It’s now available in two sizes: 37mm and 41mm. Prices: $4,400 and $4,750 (bracelet). 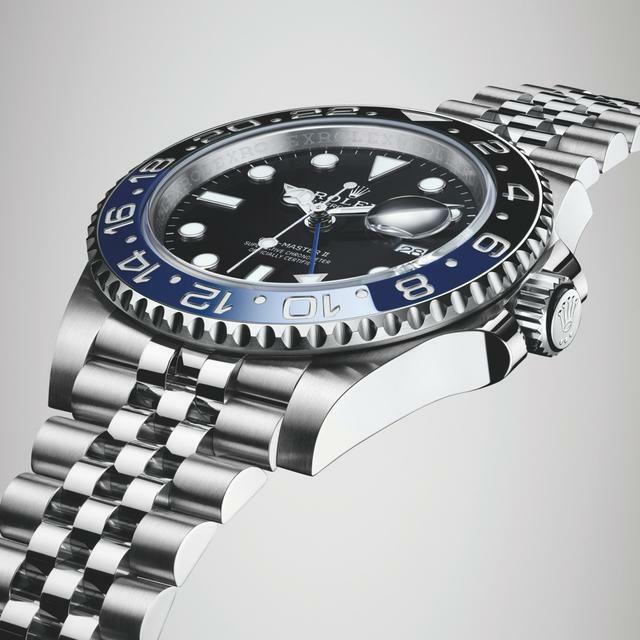 This new GMT-Master II, with its 40mm Oystersteel case and black dial, black and blue Cerachrome bezel and a new Jubilee bracelet (with Oysterlock clasp), drew accolades from both critics and consumers this year. Less showy than last year’s GMT-Master II with a red and blue bezel, this new so-called Batman GMT retains the excellent Caliber 3285, fitted with the Rolex Chronergy escapement and capable of seventy hours of power reserve. Price: $9,250. 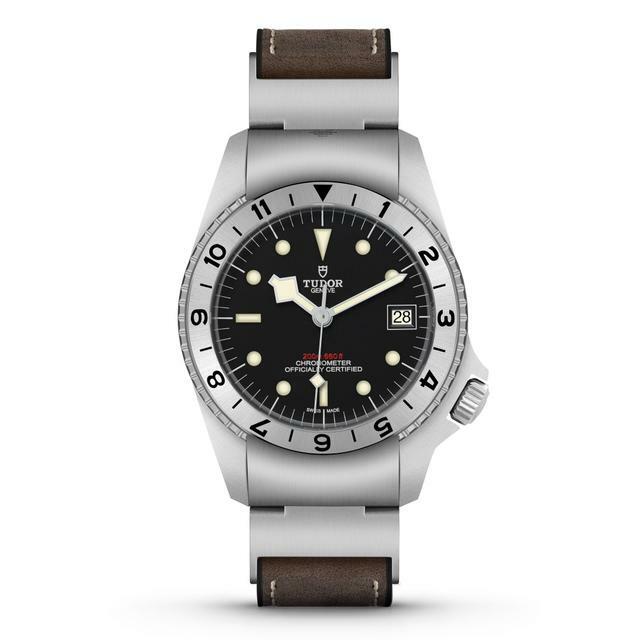 Tudor's new Black Bay P01. Based on a prototype developed in the late 1960s and proposed to the U.S. Navy, this surprising 42mm steel watch enhances Tudor’s Black Bay tool-watch bona fides. Utilitarian to the nth degree, the P01 features an unusual bezel-stop mechanism at 12 o’clock, meant to echo a more elaborate lock and removal system on the 1968 original. The specs are all here: 200-meter water resistance, easy-to-read and luminescent hands and markers, a date and snowflake hands. Placed on a tough, comfortable hybrid leather and rubber strap, the watch is priced at $3,950.